The Common Core has raised the bar for students—and their teachers. 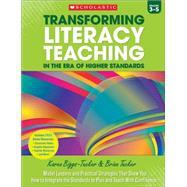 In this comprehensive resource, master teachers Karen Biggs-Tucker and Brian Tucker describe the teaching shifts needed to help students meet the rigorous demands of the new standards, showing teachers how they can build upon good practice already in place and take it up a notch to address higher standards. With charts highlighting changes, sample lessons that take instruction to the next level, and plenty of practical tips and how-to’s, this will be a welcome companion for any teacher working with rigorous standards. Includes downloadable videos and teaching resources! For use with Grades 3-5. Dr. Karen Biggs-Tucker has been an elementary school teacher for twenty-five years working extensively in grades two and five. A graduate of Loyola University's doctoral program, Dr. Biggs-Tucker loves to share ideas with others about how to instill a love for both reading and writing in students of all ages. Dr. Biggs-Tucker's research interests include children's literature and literacy engagement. Brian Tucker has been an elementary school teacher at Wild Rose Elementary School in St. Charles, Illinois. He currently teaches fifth grade.